Experts warn of a "substitute teacher effect." Even Republican lawmakers have voiced concern about a leadership void at critical agencies. But President Donald Trump appears in no rush to fill many of the vacancies. By the end of the week, 10 major leadership positions in the Trump administration -- including some of the most critical in the government -- are expected to be filled by individuals serving in an acting capacity. Acting Defense Secretary Patrick Shanahan has been his temporary status for almost four months, since James Mattis left at the end of December. Besides Shanahan, the "acting" senior leadership includes soon-to-be acting Homeland Security Secretary Kevin McAleenan, acting Interior Secretary David Bernhardt, acting Budget Director Russell Vought, acting White House Chief of Staff Mick Mulvaney, acting U.N. Ambassador Jonathan Cohen, acting FEMA Administrator Pete Gaynor, acting ICE Director Ronald Vitiello, a soon-to-be acting administrator of the Small Business Administration and a soon-to-be acting commissioner of Customs and Border Patrol. The president himself has expressed a preference for the "flexibility" that comes from having non-permanent leadership. "I sort of like acting. It gives me more flexibility. Do you understand that? I like acting. So we have a few that are acting. 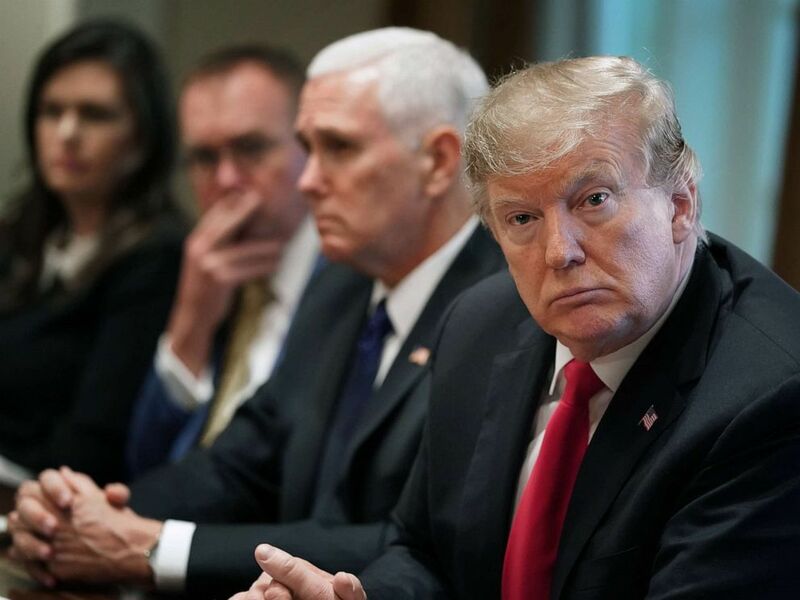 We have a great, great Cabinet," the president said in January. The U.S. Constitution lays out a key oversight role for the Senate to "advise and consent" the president’s choices for key administration posts. But the Senate’s consent is outstanding for hundreds of top jobs across the executive branch on top of the key agency leadership roles. President Donald Trump joins a bilateral meeting with NATO Secretary General Jens Stoltenberg in the Cabinet Room at the White House, April 2, 2019, in Washington, DC. Across the administration broadly, approximately 20 percent of key government posts requiring Senate confirmation have no nominee. There are 140 of the 717 key government posts requiring Senate confirmation that have no nominee, according to the nonpartisan Partnership for Public Service, which aims to increase government effectiveness. Another 10 positions are awaiting formal nomination, while another 134 have been formally nominated but are awaiting Senate confirmation. The wide-ranging vacancies have gained attention in recent days as the president executes a dramatic shakeup at the Department of Homeland Security amid presidential frustrations over a recent surge in Central American migrants. After the president announced on Sunday that Homeland Security Secretary Kirstjen Nielsen would be resigning, it was announced on Monday that the Director of the Secret Service would also be heading for the exits. And by the week’s end, more than half of the DHS agency heads -- leadership positions that come under the umbrella of DHS OR report to DHS Secretary -- could be gone. Tuesday evening, Nielsen announced on Twitter that acting Deputy Secretary Claire Grady has offered the president her resignation, effective Wednesday. But while the administration has shown no concern for the state of impermanence across many of the federal government's top jobs, some outside observers are sounding the alarm about the negative impact on government effectiveness. "The disruption that this causes is very large and should not be underestimated," said Max Stier, the CEO Partnership for Public Service. "Presidents should be judged on the policies they choose but also on how they manage the larger institution." Stier warns of a widespread "substitute teacher effect" across the administration whereby the "acting" leaders "don’t get the respect in the classroom and also don’t personally view themselves as responsible in the long run." Stier says there's an additional, second layer of complication caused by the administration moving individuals from their permanent job to temporarily fill another job, thereby creating additional holes. "There’s also this trend of taking people out of their jobs to fill top jobs and then not filling the deputy gaps, so it’s a game of musical chairs," he said in an interview with ABC News. Stier points to the example of the president’s pick of Kevin McAleenan to serve as "acting" DHS secretary and shifting him away, at least temporarily, from his permanent job leading Customs and Border Protection. John Cohen, an ABC News contributor and a former acting in Department of Homeland Security, spoke from personal experience in having served as an acting leader for a time during the Obama administration. "As the acting person, and I speak from experience, you’re very much aware that you are temporary and your replacement can come at a moment's notice, so there’s this sense of discomfort about trying to bring organizational change," said Cohen, who recalled learning that a permanent leader had been named to the job he had been filling in an acting capacity through a White House press release. In addition to being unable to execute on a long-term vision, Cohen said, acting leaders can be more beholden to the political whims of the presidents they serve than Senate-confirmed leaders. "This makes them potentially vulnerable to political pressure and when the acting official is serving in a cabinet level role it makes them more likely to yield to the demands of the president," Cohen said. "When you don’t have the most senior levels of the executive branch filled with confirmed permanent appointees, it’s bad for morale within the affected agencies, it is extraordinarily disruptive, and it can actually impede effective collaborative among government agencies," Cohen said.